Winter is on the way, and many areas have already experienced their first snowfall, along with frigid temperatures. It may be cold, and daylight is limited, but some rare phenomena only occur in these conditions. When you combine snow, ice, and freezing temperatures, many unique things can happen. When you want to make a snowman, you start with a snowball and then roll it along the ground until the ball grows to the size you want. A snow roller is nature's version of this; the main difference is that it doesn't start with a snowball and therefore is hollow. They occur when the temperature is just above freezing, allowing for the top layer of snow to separate from harder snow or ice below it. 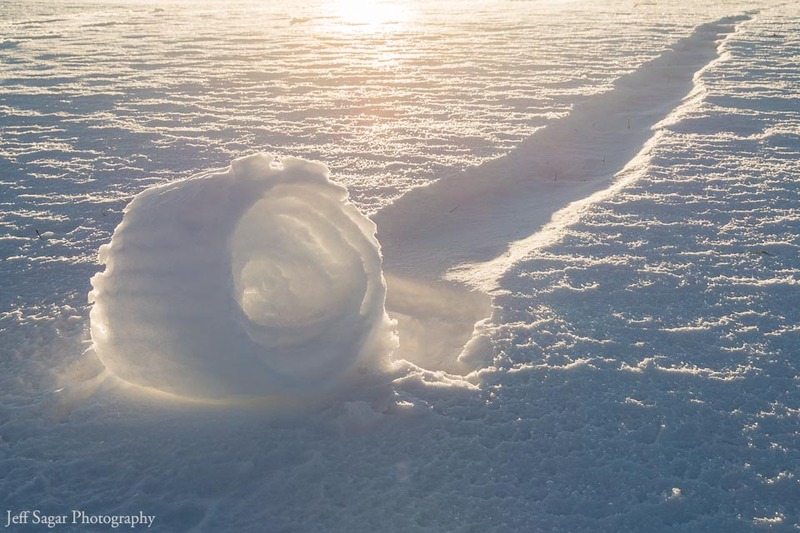 At this point, the wind can blow the snow downhill into a cinnamon roll shape. Too much wind and they get blown apart, too little, and they don't form. While rare, they tend to be spotted more in the countryside. 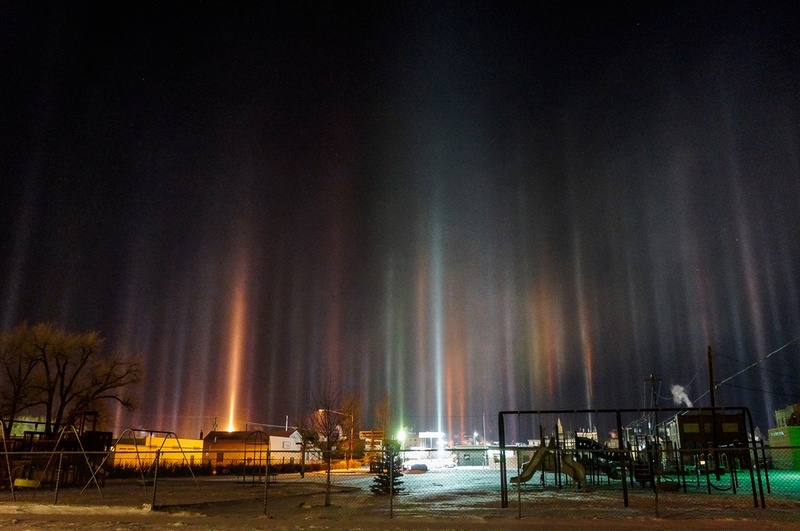 Alien encounter or ice pillars? If you see thin streams of lights extending vertically into the night, it's more than likely a terrestrial phenomenon. You need just the right type of ice crystals for this optical illusion to be seen. When many crystals are shaped like a hexagonal plate and fall horizontally, they act like a mirror and reflect light into a column. You may have seen something similar to this during the day as the same process creates sun pillars. Without the leaves in the background, it would be easy to believe that the above photo was the top of an older adult's head. 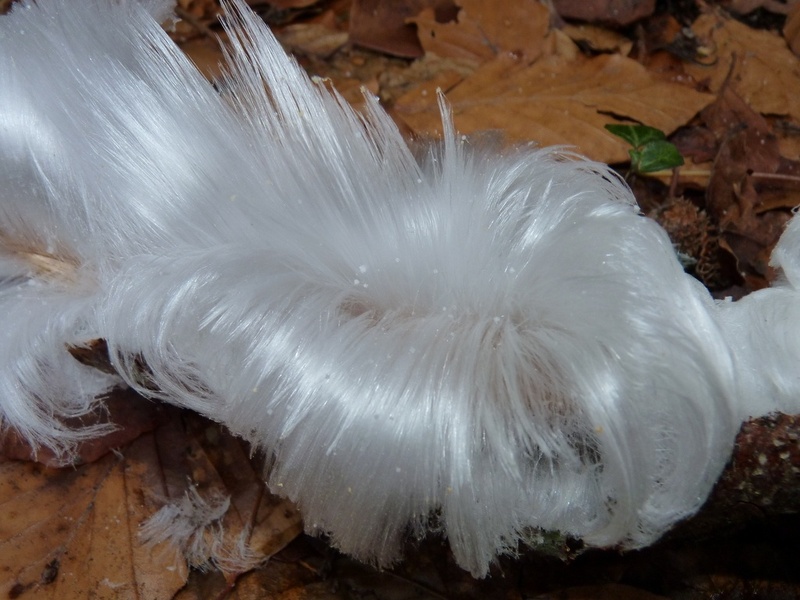 Hair ice, also called frost beard or ice wool, is a perfect description of this natural wonder. It grows on moist, rotting wood in humid conditions when the temperature is below freezing. Studies have shown that a fungus, called Exidiopsis effusa, also needs to be present. The molecules in the fungus stabilize the ice crystals and prevent them from growing too large. Ice hair is very brittle and can last for hours. If you want to see frost flowers, you need to look for them in an area where the ground hasn't yet frozen. They form on mornings below freezing when sap expands in long-stemmed plants causing cracks to develop. Thin layers of ice then form and grow longer as more water is pulled up in capillary action and extends out of the stem. The ice ribbons look similar to flowers; however, they are incredibly delicate and melt in the sun. 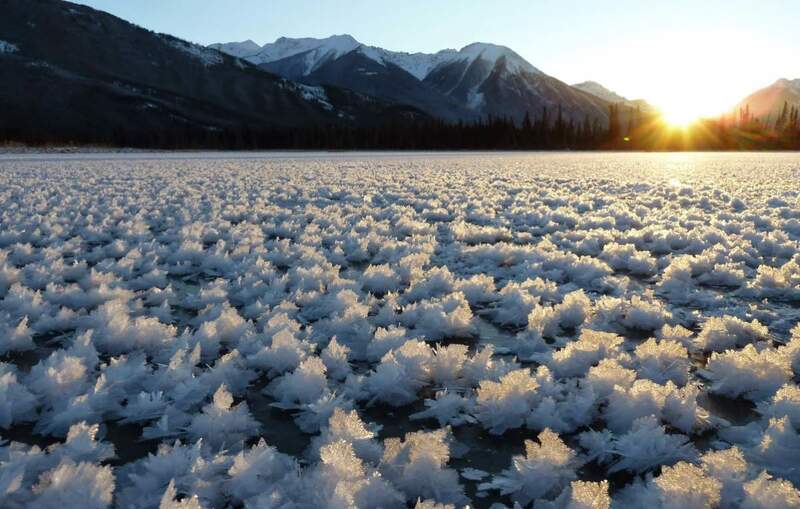 Another type of frost flower only blooms over the ocean. The temperature needs to be 7-8°F below zero with calm winds, but once formed they can last for up to two weeks. These ice clusters are made from seawater and can have three times the salinity of the ocean. Scientists have found them to contain one to two million bacteria, which is being studied to learn how they got there. Have you ever seen any of these frosty oddities? If so, post a photo for those of us in warmer climates to see! Are there other unusual natural phenomena that you've only noticed when it's cold out? Let us know, and we may write a blog about it!